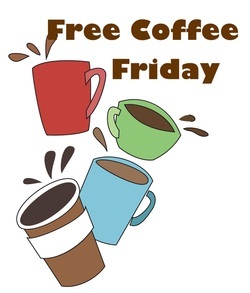 In an effort to reach out to some of the daily commuters that travel past the church each morning, we are going to offer Free Coffee Fridays beginning on July 11th and ending on August 1st. To get your free cup of coffee and a muffin all you need to do is DRIVE-THRU the church parking lot and we will hand it through your car window to you. Then you just keep on driving. We will also offer a juice (could be apple or maybe orange) in case you don't happen to be a coffee drinker. We will begin around 6:30 a.m and end when the traffic dies down, sometime between 7:30 and 8:00 a.m. So if you want some free coffee, then drive through and have one on us.